As the 21st Anniversary of Ultra Miami is officially a wrap, electronic music fans and industry members are surely still in a blissful state of replaying their marvelous memories and reflecting on another extraordinary celebration. 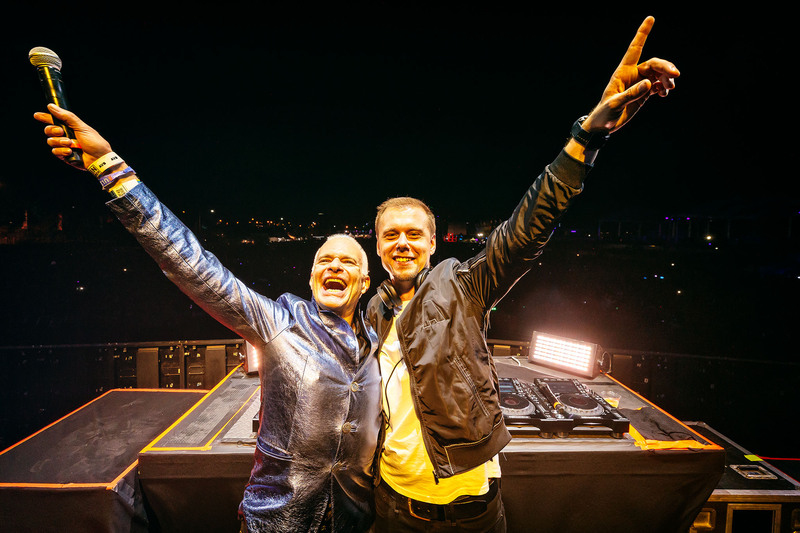 Festivities were rolling nonstop during Miami Music Week and Ultra over this past weekend, and there is no one quite like dance music legend Armin van Buuren to look to for fantastic illustrations of how the extravaganza went. There is an undeniable intense allure that draws hearts, minds, and bodies into Armin performances like clockwork. Armin’s musical prowess is one of everlasting proportions, and he exceeded expectations in proving this all through Miami Music Week (MMW) and Ultra. From a Winter Music Conference panel, to numerous MMW appearances at incredible parties, to two inventive Ultra sets, everyone received a full, proper dose of Armin this year in Miami. Coming well-equipped with an arsenal of new music like “Turn It Up,” “Don’t Give Up On Me,” and “Lonely For You,” nevermind the plethora of freshly minted records from the upcoming A State Of Trance 2019 compilation, Armin came ready for a brilliant takeover. Armin’s outstanding presence throughout Ultra weekend was an enormous joy to attendees, who had the chance to experience unmatchable amounts of versatile sounds, tracks, and surprises during his several performances. Saturday night Armin held down Mainstage like a champion, uniting Trance with his attractive new tunes that offer even more fresh and stylistic vibes. Sharing the stage with none other than David Lee Roth, lead singer of American iconic rock band Van Halen guest-appeared to perform “Jump” for Ultra – quite a surreal moment for those who witnessed. Following last year’s thunderous “Blah Blah Blah,” the “Turn It Up” successor blew everyone away with its massive festival stage power. Crowds went especially wild as Lucas & Steve jumped up alongside Armin to perform their brand-new single “Don’t Give Up On Me.” Armin’s innate ability to cross the electronic Spectrum and its genres, collaborating with diverse artists such as Lucas & Steve is one of the most delightful aspects about him and his music. Switching over to Sunday’s ASOT (A State Of Trance) day, it felt like home as he took everyone on an extended journey through time and space, featuring everything from the depths of dark techno music, to crystallized and classic rolling trance, to pulsating harmonious soundscapes, and much more in-between. As if fans weren’t already over the moon about spending two hours with Armin at his ASOT closing set, they lost their minds finding out it was extended to 3.5 hours as he became the fill-in for Eric Prydz who was unable to make his slot. Sending the dancefloor into a dizzying frenzy, crowd energy was truly remarkable from start to finish as party goers gave it their all for Ultra day 3. We sat down to have a nice chat with Armin as Miami Music Week was getting started – read on to see everything he had to say about all things Miami, new music, 2019 highlights and more in our interview below! The Nocturnal Times: Welcome back to Miami Music Week & Ultra Music Festival! How does it feel to be back? Armin van Buuren: Good! I would miss it if I wasn’t here. It’s like the New Year’s Day on the calendar for the music year. A lot of DJs are stuck in their studios in January and February, then they come out and now they show their new music to the fans. The Nocturnal Times: You started off the week with your WMC panel discussing A State Of Trance. Tell us about it? Armin van Buuren: It was exciting, I’ve never really done many panels here in Miami but I liked the idea to talk about A State Of Trance. Also with the upcoming event on June 29th in the Bay Area (Oakland Coliseum) so that’s a big gamble I’m taking. We’re hoping we can take A State Of Trance across the atlantic for the first time in seven years. Utrecht was massively successful but that doesn’t guarantee anything for the Bay Area, fingers crossed. We have the capacity of 25,000 so it’s BIG! The Nocturnal Times: Yesterday we caught you at the SiriusXM House of Chill event, what other party plans are in the works this week? Armin van Buuren: I played a surprise party at the DJ Mag pool party which was a lot of fun. The DJ Mag guys are great, they’ve been supporting me for a long time. I did a little secret set at Sirius which was a chill out set, I love to do that. It was very different and people have been loving it. I’ve been playing 100% of my own material which I’ve never done and that’s exciting. Tonight I’m playing STORY which will be exciting. I was at STORY in December but Miami Music Week is always fun and I have so many new tracks I want to spin. I’m playing Shaq’s Fun House on Friday and probably doing some surprise appearances here and there. There’s a lot of DJ friends here too but I want to take it a little easy because lately I’ve been feeling a little tired from all the things I’ve been doing – I don’t want to burn myself for Saturday. Saturday is the most important one, I’ve got a big plan for the Mainstage and I’m really excited. I love my set time and I hope the weather’s going to be a little better & not so windy. I’m a little bit excited to see the new location for Ultra – that’s city politics and it’s nothing we can control. I feel like I have to stick by Ultra since they’ve been supporting me for so many years. Ultra is such a great brand I hope they can figure it out logistically. It looks good though, they’ve got so many things going on and are planning with the transport so fingers crossed that the Mainstage will be cool. I really will miss the Downtown Miami backdrop but maybe it’s good to shake things up. I remember it was at Bicentennial Park and I was really gutted that they moved it. Let’s not forget Ultra started at the beach. Ultra is such a global brand and I know that Adam and his friends have everything in order to make it a really great Miami. The Nocturnal Times: Sunday is the big two hour closing set at ASOT (A State Of Trance). What do you have in store for fans? Armin van Buuren: I’ve got a new compilation coming out May 2nd, A State Of Trance 2019. This is the annual compilation that we do so I have a lot of exclusives for that. I have a few new tracks up my sleeve and I’m ready to premiere them. I’m excited about that and it’s going to be different because we’re not at the Megastructure we’re at the Live Stage taking that over to Sunday. We’re doing a 12 hour marathon broadcast again from Miami so that’s going to be really cool. The Nocturnal Times: What is your favorite part about being able to perform at both Mainstage and ASOT? Armin van Buuren: That’s what keeps my job fun. I guess if I would have been an airplane pilot I wouldn’t want to fly just to Miami… I’d want to fly to Hamburg and fly to Moscow. Just the fact you do different sets at a different location you have a different vibe. It’s like you do the same game but you mix it up and what I love about it is the dynamic of that. There’s different crowds & different energy, it’s exciting as well because not everything works all the time so we’ll see. The Nocturnal Times: You mentioned having a few new tracks to play this weekend, are they originals or collaborations? Or both? Armin van Buuren: Yes, originals and collaborations and one of those I can reveal already so here’s the scoop if you want. I’ve done a track with Lucas & Steve called “Don’t Give Up On Me” with Josh Cumbee on vocals who I worked with before on “Sunny Days.” We’re going to do something big with that on the Mainstage and that’s coming out tomorrow. The Nocturnal Times: What in particular do you want to share with fans about the new music you’ve been releasing? Armin van Buuren: There’s a lot more coming, this has only been the tip of the iceberg so far. I can’t really reveal too much about the upcoming singles because there’s so much to talk about for the current single like the single with Bonnie McKee “Lonely For You.” That was a great thing I’ve done with her and it was a little bit of an experiment because of the breakbeat track releasing in the era of when everything is 105 BPM and stuff. But that’s what I want to do I want to shake things up a little bit, I’m tired of having to listen to anyone on what I’m going to do. Obviously it means that not everybody is going to maybe appreciate what I do or every track, but I’m not asking for that. I think I can fairly say that Armin van Buuren is not repeating himself and I take that proudly. I think it’s important as an artist if you want to stay relevant, and more so for myself. If I would be repeating myself and making the same stuff over and over then I would lose the fun of it. The Nocturnal Times: Speaking about more of the new music & how you have incorporated different sounds like pop to expand horizons, not everyone understands that. Can you share a few thoughts on that? The Nocturnal Times: Your weekly vlog is something fans have really loved since you first began making them. What made you want to get into shooting vlogs? Armin van Buuren: Again, it’s also part of changing your routine. First and foremost I do it for myself because I’m in a fortunate position where I experience a lot. Not everything is positive but I make a lot of memories and you forget easily. It’s like my diary, a visual diary and that’s fun. It’s also 2019 – we all have Instagram stories, we all make vlogs and everything. A lot of the time people are more interested in how Armin van Buuren ties his shoes than the cover of his mix compilation because that’s just the reality of 2019. I don’t mind sharing that information with my fans I just thought that people wouldn’t be so interested in how Armin van Buuren ties his shoes but – let’s face it that’s what people want to see! People want to be able to see themselves in you. It took a bit of effort for my social media team to convince me to do it but now I’m doing it and I’m getting better at it. It’s just fun, people can actually see what’s going on, it’s not a secret or anything.